How to Easily Master Format HTC DESIRE 816 (DUAL) with Safety Hard Reset? Tips and important information about HTC DESIRE 816 (DUAL) problem solving. The HTC DESIRE 816 is an Android smartphone with HD 720p LCD screen at 5.5 inches Super LCD 2 touchscreen. It have 1.5 GB RAM using quad core 1.6 Ghz processor give good performance for our daily activity. HTC bring back the megapixel camera to HTC DESIRE 816 main camera, previously they use Ultra Pixel as HTC smartphone camera standard, but this phone camera have 13 megapixel main camera in the back side and for 5 megapixel front camera for video conference or selfie photo profile. HTC DESIRE 816 release by two version, the single GSM simcard and DUAL GSM simcard. How to Fix or Problem Solving for Recovery HTC DESIRE 816 (DUAL) hang or not responding or malfunctions or stuck or freezing or bricked ? The interesting that we get from HTC DESIRE 816 is the user interface. HTC Sense UI 6.0 already installed into HTC Desire 816 for default launcher, there are also some other factory default applications that can be use out of the box, some HTC Sense UI features also included HTC BoomSound, HTC Zoe, HTC BlinkFeed. If we would like to install more applications, we can get either for free or purchase at Google Play Store. But we also have to be careful, because there are some applications that not compatible with our HTC DESIRE 816 and some applications also not safe to install because it contain malicious thing inside that applications,. If we has installed that applications from Google Play Store, then our phone sometime become act not normal like hang or stuck or bricks or broken, some phone also get trouble to always reboot or boot logo loop, there are also some trouble that make the LCD touch screen of HTC DESIRE 816 (DUAL) not responding. At this situations, we have to force soft reset or force shutdown or reboot the HTC DESIRE 816 (DUAL) to remove any cache and temporary files. If the problem still happen, then we have to do hard reset or master format. Please remember, doing hard reset will remove or wipe any important data and delete installed applications, therefore we have to do backup important data before performing hard reset. 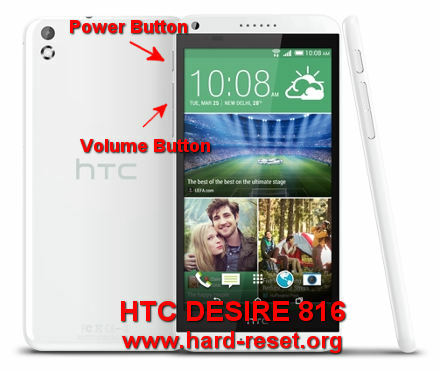 How to Force Shutdown or Force Soft Reset or Reboot or Restart HTC DESIRE 816 (DUAL) ? What should we do when our phone become freeze or hang in the middle of running applications? We need to force shutdown or force soft reset or restart HTC DESIRE 816 (DUAL) to delete temporary files or cache and refresh all running applications in the system memory. Please press and hold the POWER button until the phone shutdown by itself. If the phone already totally off, then continue press POWER button again to turn on the phone. This process can be also do when our phone at normal situations, please press and hold the POWER button until pop-up menu appear, then choose Shutdown or Power off or Restart at that pop-up menu. Do not worry, the process of soft reset or reboot are safe, because it will not remove any important data and will keep any installed applications. The HTC DESIRE 816 (DUAL) will do the master reset for several minutes, just wait until it finish. How to Restore and Reinstall Clean Android Operating system / firmware at HTC DESIRE 816 (DUAL) (Reformat) ? After install some applications from Google Play Store, some users have trouble with this phone. Usually the problem happen because the operating system of HTC DESIRE 816 (DUAL) damage or corrupt or broken. Of course we have to reinstall or restore or reformat the factory default operating system for our HTC DESIRE 816 (DUAL). We have to know, that the clean factory default Android Kitkat operating system already saved safely inside HTC DESIRE 816 ROM. At normal procedure this files can not be access by the users. Therefore, if our operating system need to reinstall or reformat, then we can install it without need to connect with other gadget or copy from other device. Just follow the steps for hard reset or master format above, then the clean factory default Android operating system or firmware will be reinstall automatically. How to Unlock or Fix or Bypass or Solutions for HTC DESIRE 816 (DUAL) forgot password code or security lock screen pattern or pin (lost password)? There are some factory default security protection that can be activate at HTC DESIRE 816 without need additional installation. Although some users think that the data are not very confidential, but giving more security protections are recommended to do. We usually suggest to use screen lock pattern but some users still like to use other protection like password pin protections. The problem happen when we forget about the answer for this security protections. However, this problem have simple solutions to bypass or unlock forgot security protections using Gmail username and password. Please give several time wrong answer continuously until the phone locked or freeze about 30 seconds. At this time, we will fine Forgot Password / Pattern button to press for unlock forgotten security protection using Google account that we have already signed in before. If we can not access Google account at this phone, then the last solutions we can do is doing hard reset using hardware button combination key. How to Improve Performance HTC DESIRE 816 (DUAL) to make run more faster? The performance of Quallcomm MSM8928 are fast because it is quad core processor with 1.6 Ghz clock speed. Although the RAM are not 2GB, but 1.5 GB are already big enough for almost any applications at his phone. What make the performance of HTC DESIRE 816 become slowly? Usually this problem happen because there are too many applications run in the background. We have to know that all applications run at Android will need some amount of RAM and processor resource. The Android is real multitasking smartphone, so if we run many applications together than the RAM will be insufficient and the HTC DESIRE 816 will try to find which applications can be stop. This steps will need some time which sometime can make our phone become slowly to response. That is why we recommended to uninstall some not use applications. If we want to make our HTC DESIRE 816 performance run faster again like new, then we have to consider doing hard reset or reformat this phone. Is That Any Secret Code for Doing Format HTC DESIRE 816 (DUAL) ? There is no secret hidden code for HTC DESIRE 816 (DUAL) to make it back to factory default. Do the options above to hard reset it. How to make Longer Life for HTC DESIRE 816 (DUAL) Battery Saving Not Fast to Drain (power safe) ? The HTC DESIRE 816 (DUAL) use 2600 mAh capacity battery. The most battery drain at our HTC DESIRE 816 (DUAL) is the LCD screen and the 3G or LTE network connection, please use it as wise as possible. The LCD screen should use low brightness to safe the power battery. If we not use some additional connection the we should turn it off like Bluetooth or Wifi or GPS to safe the battery live. If we are away from the charger but we need to make the battery work longer, then please choose 2G only at network connection, it will safe the battery capacity, but using 2G will make our data connection become slowly. How to Upgrade HTC DESIRE 816 (DUAL) to Android Kitkat or Lollipop ? The factory default Android operating system version of HTC DESIRE 816 (DUAL) is Android Kitkat. Can we install HTC DESIRE 816 (DUAL) with Android Lollipop? The specification are acceptable to run Android Lollipop without any problems, but we have to wait the official Android Lollipop version 5+ to make all features run without problems. Please check the update from menu Setting > About phone > Software update. [A] Hi, maybe the update process has been interrupted. Please try to do hard reset using hardware button combination key like steps at #option 2 above to make sure the OS file source still can work or not. If still can not work, then we suggest to bring your HTC Desire 816 to authorized HTC service center to flash the proper OS. [A] Hi, please try to do hard reset using hardware button combination key, it will restore your HTC Desire 816 operating system to factory default. But please make sure your battery is not empty before doing hard reset. 100% full capacity is recommended for battery capacity state before doing hard reset. How to Easily Master Format LENOVO K320T with Safety Hard Reset? Hi, please try to force soft reset or force shutdown by press and hold your HTC Desire 816 Power button until it shutdown, and after you are sure your phone already totally turn off, then press POWER button again to turn it on. If this steps still can not wake up and turn on your HTC Desire 816, then follow steps at #Option 2 above for doing hard reset using hardware button combination key. Even hard reset not working . while restarting it shows HTC logo as usual , but blank screen after that. It shows SD init fail. When tried other option . How to recover the phone ?. Hi, usually this problems can be fix by doing hard reset using hardware button combination key like steps at #option 2 above, it will reformat your HTC Desire 816 operating system to factory default. Hi, my htc 816g octacore mobile suddenly had a problem with camera.Only front camera is opened by default. I cannot switch to rear camera.The icon to switch to rear camera is also not showing. I have made factory reset also, but of no use. Please help me to restore my camera to normal. Hi, usually after doing hard reset, then your front camera will work like beginning again, because your operating system will reformat to factory default, but if the camera still not work then we are worry the problems comes from camera hardware. Please try to consult with HTC authorize service center to test your HTC 816 front camera hardware. Hi, usually after your HTC Desire 816 totally battery empty, then it will need about 30 minutes to 1 hour connected to charger, so it will not give any notifications for several minutes after power charger can give about 5% capacity, then you can see the charging notification. Please try do recharge it again. If still not work, then try to use different Android charger with minumum 1 A current output and wait about 30 minutes to 1 hour again. My HTC Desire 816 got problem that it always goes to reboot or boot menu loop…. Hi, we suggest to do hard reset using hardware button combination key like steps at #option 2 above. That process steps will reformat your HTC Desire 816 operating system to factory default. Hi, please try to do hard reset using hardware button combination key, it will restore your HTC Desire 816 operating system to factory default. But please make sure your battery is not empty before doing hard reset. 100% full capacity is recommended for battery capacity state before doing hard reset. Hi, maybe the update process has been interrupted. Please try to do hard reset using hardware button combination key like steps at #option 2 above to make sure the OS file source still can work or not. If still can not work, then we suggest to bring your HTC Desire 816 to authorized HTC service center to flash the proper OS.